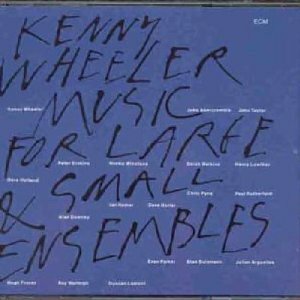 I first heard of Kenny Wheeler in the late 80s, when I was looking through secondhand LPs in David's Book and Music Shop in Letchworth, Herts. I came across his Gnu High* (1975), which I think caught my attention because of the colourful abstract photo on the sleeve (I'm still not sure what it depicts, if anything), and because it's got Keith Jarrett on piano. I bought it, took it home, played it, liked it. But I don't think I investigated any more of Wheeler's music until 1990, when there was a broadcast on Radio 3 of one of his concerts. I taped it**, and listened to it over and over again. Kenny Wheeler was born in Toronto, Canada, in 1930, and moved to England in 1952, where he was based for the rest of his life. He played trumpet in many groups in the 50s and 60s, but didn't make a record under his own name until 1969, when he recorded his suite Windmill Tilter (inspired by the story of Don Quixote) with the John Dankworth band. (The fact that his career didn't really get going until he was nearly 40 should give encouragement to late starters everywhere.) He became a composer of rare talent; The Sweet Time Suite (the main piece in the taped concert) was written for a tour celebrating his 60th birthday. You can listen to it on Youtube here***. It's scored for a big band****, is in eight parts and lasts about 49 minutes. As it's a suite, the composer has tried to structure it to make a coherent sequence, but obviously there's nothing to stop you listening to individual movements. Even more obviously, there's no requirement to read my half-baked thoughts on it. I recommend you just listen to it. It's beautiful. Part I (disappointingly called 'Opening' - Wheeler seems to have used up all his creativity in the music in this suite and had little left over for the titles) begins with a gorgeous saxophone choir, with Norma Winstone's wordless vocals blending in so seamlessly that at first you hardly notice they're there. If dawn were audible, this is what it would sound like - the promise of a new day, a new beginning. If the suite is 'about' anything, I suppose it takes us through the hopes and, even more so, the worries of a day, of a lifetime. (Instrumental music isn't 'about' anything, but this suite does contain a song, which is about something, and this colours the whole suite.) The 'sweet' of the title is partly ironic, because there's plenty of doubt and even anguish along the way, but there is real sweetness too. Part II ('For H.') picks up the pace, with trumpets raising the roof, as they're apt to do in big band music. Stan Sulzmann's tenor solo***** builds beautifully, with confident support from the brass. At 6.10 Part III ('For Jan') begins with an elegant time shift from 4/4 to 3/4 and a simply lovely valve trombone theme statement, followed by another statement from Wheeler himself on flugelhorn******. This is such a fabulous, gently melancholy tune. Wheeler's flugelhorn solo seems to be searching and aspiring and longing, but ends questioningly. Winstone sings her own lyrics to Wheeler's melody, a portrait of a woman getting through the day. The line 'her smile hints at sadness' emphasises the light and dark within the suite. I'm not fan of jazz vocalists, but Winstone, with her pure, unbluesy (could I say very English?) voice suits Wheeler's music perfectly. Part IV ('For P.A.') begins very tentatively, feeling its way as if unsure which direction to take. Evan Parker's tenor sounds troubled, and even when the tempo picks up at 15.30 the tone is still far from sunny. The tenor gets more and more agitated, perhaps even angry, and at 16.30 bursts out into a brief tumult of disorientating free jazz anarchy. 'Life's never easy, life's never fair' as the lyric in the previous part has reminded us. This is quelled at 16.44 by assertive chiding from the band, (I originally wrote 'assertive chording', but then autocorrect intervened; I like 'chiding' so I'll keep it), and at 19.41 a triumphant new theme emerges. However, at 20.18 the quietly questioning tenor returns. This is the most varied and emotionally complex of all the movements. Part V ('Know Where You Are') is the most straightahead, swinging movement, (is this the meaning of the title? ), with stabbing brass chords and a graceful piano solo from John Taylor*******. Do I even hear a brief quotation from Gershwin's big band staple 'Fascinating Rhythm' at 23.28? But even here there are some unsettling rhythmic shifts, for example at 24.48, and John Abercrombie's guitar solo sounds somehow otherworldly. Part VI is called 'Consolation', and it is indeed consoling, another bewitchingly sublime tune. Like Part IV, the beginning seems to be seeking something as Winstone floats around, but eventually the theme is found, the bass stating it particularly tenderly. Ray Warleigh's alto solo is yearning, but altogether this movement is radiant and restful. Part VII ('Freddy C'), however, throws us right back into troubled waters. The free jazz intro creates tension, and is almost sinister. Peter Erskine's drum solo is quite unlike those featured by more conventional big bands - forget Gene Krupa. The rhythm is disruptive and disturbing, but gradually the tempo coalesces and at 39.30 the band plays the rising theme. Wheeler's flugel solo swings but is still sad, to my ears at least, though Duncan Lamont's tenor solo is much breezier. At 45.24 the trumpets follow each other joyously, (one of my favourite passages in the whole suite), but at 46.45 introspective anxiety seems to be winning again. Part VIII ('Closing') repeats Part I, but this time with Wheeler's flugel spinning over the top. If Part I was sunrise, this must be sunset and oncoming night, and there are certainly hints of darkness and unease, though if it's melancholy, it's beautifully melancholy. The very last note Wheeler plays is a flat fifth (in this case a G in the key of D flat), a note traditionally associated with disharmony (it used to be called 'the devil's interval'). I think that The Sweet Time Suite is a masterpiece. It was released as the first disc of a two disc set called Music for Large and Small Ensembles; the second disc contains three more big band pieces, plus (as the title suggests) some for small groups. Youtube reveals that the suite has entered the standard big band repertoire, and that there is a second recording of it with Wheeler playing with a band from the University of North Texas. As jazz uses improvisation, every performance of a particular composition will be different, sometimes radically different. I wish I'd kept the tape of the live performance from 1990. 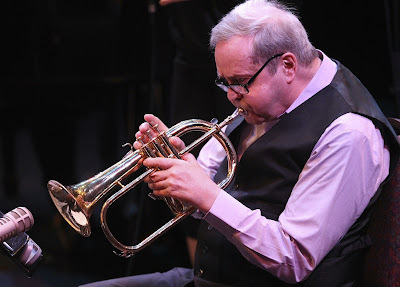 I saw the Kenny Wheeler big band twice, in 2010 and 2012 (on both occasions the whole sax section and many others in the band were the same as on the 1990 recording). They didn't play Sweet Time, but new compositions (specially written for his 80th birthday tour) that were released under the title The Long Waiting (2012). By that time he was old and frail, especially on the second occasion, but although he took ages to shuffle across the stage to get to his chair and music stand, (being rousingly applauded every step of the way), and I was worried that he was going to trip over a cable and have a fall, he still played with his customary vigour and lyricism. I was struck by the obvious respect and affection all the musicians had for him. I also saw him play with a small group, usually a quintet, half a dozen times, and once, late in his career, in the Vortex, a tiny club in north London. My legs didn't comfortably fit under the table so they were stretched out, and he came, very doddery, down the gap between the tables ('aisle' is far too grand a word), and I had to move my legs to avoid tripping him over. Such was my brush with my hero. Kenny Wheeler died on the 18 September 2014. He carried on playing, composing and recording almost until the end, making his final record, Songs for Quintet, in December 2013. He was famously self-deprecating and unassertive; although I went to quite a few of his gigs, I almost never heard him speak. He let his compositions and his playing do that for him, and thankfully they'll continue to do so. * Composers of nonpopular (which isn't the same as unpopular) music - what would generally be called 'classical' music, I term I try to avoid when possible - are usually content with titles such as Symphony no. 7 or String Quartet no. 23 for their instrumental works. Most popular music is vocal, and songs naturally have titles because they have words, so there's rarely any problem in naming them. But jazz, being predominantly instrumental, doesn't have it so easy. Which means that jazz composers have to come up with lots of titles. One of the ways Wheeler generates titles for his compositions is by wordplay. 'Gnu High' is a pun on 'new high', a phrase familiar from weather forecasts; 'Sweet Time Suite' obviously puns on sweet/suite. Other examples of titles that use language skittishly are 'Double, Double You' (i.e. WW), 'Kayak' (because it's a palindrome), 'Ma Bel Helene' (named after his sisters Mabel and Helen), 'Hotel le Hot' ('le hot' is an anagram of 'hotel'), 'Deer Wan' (a pun on 'dear one'), 'Flutter by, Butterfly' (a spoonerism), 'Going for Baroque' (obviously a piece in a jazz version of the baroque style; the title works if you use the US/Canadian pronunciation of 'baroque'), and 'See [sic] Horse' (from a suite in which the letter C, and the sea, play a part). Okay, the wordplay isn't James Joyce, but on the other had I bet James Joyce couldn't write pretty tunes. ** I used to tape lots of jazz concerts from Radio 3, but I threw them all away as outdated technology when I moved house about ten years ago, which I now very much regret - I mean I regret throwing them away, not moving house. *** I listen to plenty of music on Youtube but feel a bit guilty about doing so; if I don't pay the musicians how are they going to feed their children? This goes especially for jazz musicians, who scrape a living at the best of times. But I assuage my conscience a little by reflecting that at least I buy their CDs and concert tickets too. **** A big band, in jazz, isn't just any old band that's big, but has a precise meaning - five saxophones (two altos, two tenors, one baritone), four trombones (one of them often a bass), four trumpets, and a rhythm section of bass, drums, and piano and/or guitar. There are sometimes some minor variations in this line up, such as there being only three trombones, or the addition of a vocalist, and the saxophonists often double on soprano sax and/or flute and/or clarinet, but otherwise the format has remained more or less the same for about eighty years, since the swing era. ***** In jazz, calling something a 'solo' strongly implies that the musician is improvising rather than following the notes written by the composer. ****** A flugelhorn is very like a trumpet except its main part is conical rather than cylindrical, which gives it a more mellow, less strident sound. Wheeler was very fond of the flugelhorn, and used it a lot more than the trumpet, especially in the last few decades of his life. ******* John Taylor was Wheeler's pianist of choice for forty years. He died last month, suffering a heart attack while playing the piano at a concert.